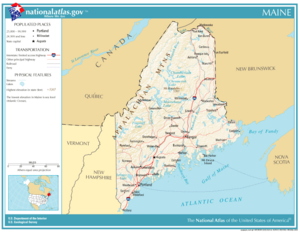 The State of Maine is a state in the northernmost portion of the New England region of the Northeastern United States. The state is known for its scenery—its jagged, mostly rocky coastline, its low, rolling mountains, and its heavily forested interior—as well as for its seafood cuisine, especially lobsters and clams. The original inhabitants of the territory that is now Maine were Algonquian-speaking peoples. The first European settlement in Maine was in 1604 by a French party. The first English settlement in Maine was established by the Plymouth Company at Popham in 1607, the same year as the settlement at Jamestown, Virginia. However, the Popham Colony did not survive the harsh Maine winters. A number of English settlements were established along the coast of Maine in the 1620s, although the rugged climate, deprivations and Indian attacks wiped out many of them over the years. As Maine entered the eighteenth century, only a half dozen settlements still survived. American and British forces contended for Maine's territory during the American Revolution and the War of 1812. Because it was physically separated from the rest of Massachusetts (properly speaking, the Department of Maine was an exclave of Massachusetts) and because it was growing in population at a rapid rate, Maine became the twenty-third state on March 15, 1820 as a component of the Missouri Compromise. 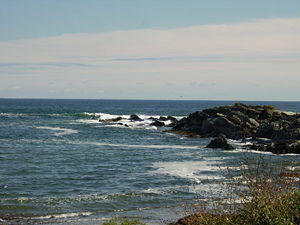 The rocky coast around Kennebunk. Mine is bounded to the south and east by the Atlantic Ocean, and to the north and northeast by New Brunswick, a province of Canada. The Canadian province of Quebec is to the northwest. Maine is both the northernmost state in New England and the largest, accounting for nearly half the region's entire land area. Maine also has the distinction of being the only state to border just one other state (New Hampshire to the west). The municipalities of Eastport and Lubec are, respectively, the easternmost city and town in the 48 contiguous states. Maine's Moosehead Lake is the largest lake in New England (Lake Champlain being partially in New York). Mount Katahdin is both the northern terminus of the Appalachian Trail, which extends to Springer Mountain, Georgia, and the southern terminus of the new International Appalachian Trail, which, when complete, will run to Belle Isle, Newfoundland and Labrador. At 33,215 square miles (86,027 sq km), Maine is thiry-ninth of the 50 states in area. Machias Seal Island and North Rock, off its easternmost point, are claimed by both the United States and Canada and are within one of four areas between the two countries whose sovereignty is still in dispute, but is the only one of the disputed areas containing land. Also in this easternmost area is the Old Sow, the largest tidal whirlpool in the Western Hemisphere. Maine is the most sparsely populated state east of the Mississippi River. Ninety percent of its land is forested; It is known as the Pine Tree State. Much of the interior and forested lands are uninhabited; some of these areas do not have formal local political organization. For example, the Northwest Aroostook, Maine unorganized territory in the northern part of the state has an area of 2,668 square miles (6,910 km²) and a population of 27, or one person for every 100 square miles (255 km²). More prosaic geologists describe this type of landscape as a drowned coast, where a rising sea level has invaded former land features, creating bays out of valleys and islands out of mountain tops. A rise in the elevation of the land, due to the melting of heavy glacier ice, caused a slight rebounding effect of underlying rock; however, this land rise was not strong enough to eliminate all the effect of the rising sea level and its invasion of former land features. Millions of people have enjoyed this coastal scenery at Maine's Acadia National Park, the only national park in New England. Maine has a humid continental climate (Köppen climate classification Dfb), with warm (although generally not hot), humid summers. Winters are cold and snowy throughout the state, and are especially severe in the northern parts of Maine. Coastal area weather is moderated somewhat by the Atlantic Ocean. Daytime highs are generally in the 75-80 °F (24-27 °C) range throughout the state in July, with overnight lows in the high 50s°F (around 15 °C). January temperatures range from highs near 32 °F, (0 °C) on the southern coast to overnight lows below 0 °F (-18 °C) in the far north. Maine is occasionally affected by hurricanes and tropical storms; by the time they reach the state, though, many have become extratropical. Few hurricanes have made landfall in Maine. Maine has fewer days of thunderstorms than any other state east of the Rockies, with most of the state averaging less than 20 days of thunderstorms a year. Tornadoes are rare in Maine with the state averaging less than two a year, mostly occurring in the southern part of the state. The original inhabitants of the territory that is now Maine were Algonquian-speaking Wabanaki peoples including the Abenaki, Passamaquoddy, and Penobscots. The area's native peoples were generally peaceful, mostly farmers and hunters. They kept a somewhat nomadic existence in the well-watered woods and mountains. They dispersed and hunted inland in the winter; in the summer, they gathered more closely together on the coast and islands and farmed corn, beans, and squash, and harvested seafood, including porpoise. The first European settlement in Maine was started in 1604 by a French group that included explorer Samuel de Champlain. The French named the entire area, including what later became the state of Maine, Acadia. English colonists sponsored by the Plymouth Company settled there in 1607. The coastal areas of southern Maine, near the mouth of the Sagadahoc (Kennebec), first became the Province of Maine in a 1622 land patent. Eastern Maine north of the Kennebec River was more sparsely settled and was known as the Territory of Sagadahock. The Province, within its current boundaries, became part of Massachusetts Bay Colony in 1652. Maine was much fought over by the French and English during the seventeenth and early eighteenth centuries. After the defeat of the French in the 1740s, the territory from the Penobscot River east fell under the nominal authority of the Province of Nova Scotia, and together with present day New Brunswick formed the Nova Scotia county of Sunbury, with its court of general sessions at Campobello. American and British forces contended for Maine's territory during the American Revolution and the War of 1812. 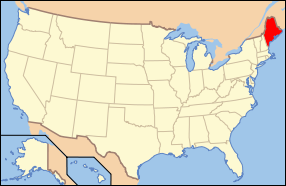 The territory of Maine was confirmed as part of Massachusetts when the United States was formed, although the final border with the British was not established until the Webster-Ashburton Treaty of 1842. Because it was physically separated from the rest of Massachusetts and its population was growing at a rapid rate, Maine became the twenty-third state on March 15, 1820 through the Missouri Compromise. This compromise allowed admitting both Maine and Missouri (in 1821) into the union to keep a balance between slave and free states. Maine's original capital was Portland until 1832, when it was moved to Augusta. Augusta is the capital of Maine, county seat of Kennebec County, and center of population for the state. 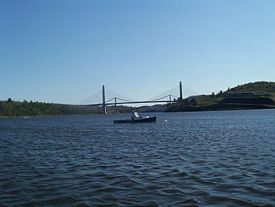 It was first inhabited by English settlers from the Plymouth Colony in 1629 as a trading post on the Kennebec River. The city's population was 18,560 according to a July 2006 estimate. Located on the Kennebec River at the head of tide, it is home to the University of Maine at Augusta. 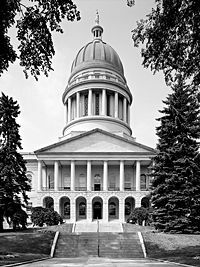 Maine's state government is composed of three co-equal branches—the executive, legislative, and judicial branches, as outlined in the Maine Constitution. Maine also has three Constitutional Officers (the Secretary of State, the State Treasurer, and the State Attorney General) and one Statutory Officer (the State Auditor). The executive branch is responsible for the execution of the laws created by the Legislature and is headed by the Governor of Maine. The Governor is elected every four years; no individual may serve more than two consecutive terms in this office. As with other state legislatures, the Maine Legislature can, with a two-thirds majority vote from both the House and Senate, override a gubernatorial veto. The judicial branch is responsible for interpreting state laws. The highest court of the state is the Maine Supreme Judicial Court. The lower courts are the District Court, Superior Court and Probate Court. All judges, except for probate judges, are nominated by the Governor and confirmed by the Legislature for full-time terms of seven years. Probate judges serve part-time and are elected by the voters of each county for four-year terms. In state general elections, Maine voters tend to accept independent and third-party candidates more frequently than most states. Maine has had two independent governors recently (James B. Longley, 1975–1979 and Angus King, 1995–2003). The Green Party candidate won nine percent of the vote in the 2002 gubernatorial election, more than in any election for a statewide office for that party until the 2006 Illinois gubernatorial election. The locally organized Maine Green Independent Party also elected John Eder to the office of State Representative in the Maine House of Representatives, the highest elected Green official nationwide. Pat LaMarche, 2004 Green Party vice-presidential candidate, resides in the southern coastal town of Yarmouth. Maine state politicians, Republicans and Democrats alike, are noted for having more moderate views than many in the national wings of their respective parties. In the 1930s, Maine was one of very few states which remained dominated by the Republican Party. In the 1936 Presidential election, Franklin D. Roosevelt received the electoral votes of every state other than Maine and Vermont. In the 1960s, Maine began to lean toward the Democrats, especially in Presidential elections. In 1968, Hubert Humphrey became just the second Democrat in half a century to carry Maine thanks to the presence of his running mate, Maine Senator Edmund Muskie. Maine has since become a left-leaning swing state and has voted Democratic in four successive Presidential elections, casting its votes for Bill Clinton twice, Al Gore in 2000 and John Kerry (with 53.6 percent of the vote) in 2004. Republican strength is greatest in Washington and Piscataquis counties. Though Democrats have carried the state in presidential elections in recent years, Republicans have largely maintained their control of the state's US Senate seats, with Ed Muskie, William Hathaway, and George Mitchell being the only Maine Democrats serving in the U.S. Senate in the past 50 years. The Reform Party of Ross Perot achieved a great deal of success in Maine in the presidential elections of 1992 and 1996: in 1992 Perot came in second to Bill Clinton, despite the longtime presence of the Bush family summer home in Kennebunkport, and in 1996, Maine was again Perot's best state. Since 1969, two of Maine's four electoral votes are awarded based on the winner of the statewide election. The other two go to the highest vote-winner in each of the state's two congressional districts. The Bureau of Economic Analysis estimates that Maine's total gross state product for 2003 was US$41 billion. Its per capita personal income for 2003 was US$29,164, twenty-ninth in the nation. Tourism and outdoor recreation play a major and increasingly important role in Maine's economy. The state is a popular destination for sport hunting (particularly deer, moose and bear), sport fishing, snowmobiling, skiing, boating, camping and hiking, among other activities. Maine's agricultural outputs include poultry, eggs, dairy products, cattle, wild blueberries, apples, maple syrup, and maple sugar. Aroostook County is known for its potato crops. Commercial fishing, once a mainstay of the state's economy, remains important, particularly lobstering and groundfishing. Western Maine aquifers and springs are a major source of bottled water. Maine's industrial outputs consist chiefly of paper, lumber and wood products, electronic equipment, leather products, food products, textiles, and bio-technology. Naval shipbuilding and construction remain key as well, with Bath Iron Works in Bath and Portsmouth Naval Shipyard in Kittery. Naval Air Station Brunswick is also in Maine, and serves as a large support base for the U.S. Navy. However, the BRAC campaign recommended Brunswick's closing, despite a recent government-funded effort to upgrade its facilities. Maine ports play a key role in national transportation. Beginning around 1880, Portland's rail link and ice-free port made it Canada's principal winter port, until the aggressive development of Halifax, Nova Scotia, in the mid-1900s. In 2001, Portland, Maine's largest city, surpassed Boston as New England's busiest port (by tonnage), due to its ability to handle large tankers. Maine's Portland International Jetport was recently expanded, providing the state with increased air traffic. Maine has few large companies that maintain headquarters in the state, traditionally in the pulp and paper industry. Some of the larger companies that maintain headquarters in Maine include Fairchild Semiconductor in South Portland; IDEXX Laboratories, in Westbrook; Unum, in Portland; L.L. Bean in Freeport; and Delorme, in Yarmouth. Maine is also the home of The Jackson Laboratory, the world's largest non-profit mammalian genetic research facility and the world's largest supplier of genetically purebred mice. Maine has an income tax structure containing 4 brackets, which range from 2 percent to 8.5 percent of personal income. Maine's general sales tax rate is 5 percent. The state also levies charges of 7 percent on lodging and prepared food and 10 percent on short-term auto rentals. Commercial sellers of blueberries, a Maine staple, must keep records of their transactions and pay the state 1.5 cents per pound ($1.50 per 100 pounds) of the fruit sold each season. All real and tangible personal property located in the state of Maine is taxable unless specifically exempted by statute. The administration of property taxes is handled by the local assessor in incorporated cities and towns, while property taxes in the unorganized territories are handled by the State Tax Assessor. Maine has passenger jet service at its two largest airports, the Portland International Jetport in Portland, and the Bangor International Airport in Bangor. Both are served daily by many major airlines. Essential Air Service also subsidizes service to a number of smaller airports in Maine, bringing small turboprop aircraft to regional airports such as the Augusta State Airport, Hancock County-Bar Harbor Airport, Knox County Regional Airport, and the Northern Maine Regional Airport at Presque Isle. These airports are served by US Airways Express with small 19 to 30 seat planes. Many smaller airports are scattered throughout Maine, only serving general aviation traffic. Interstate 95 runs through Maine, as well as its easterly branch I-295. In addition, U.S. Route 1 starts in Maine and runs to Florida. The eastern terminus of the eastern section of U.S. Route 2 starts in Houlton, near the New Brunswick, Canada border to Rouses Point, New York, at US 11 . There is also another US 2A connecting Old Town and Orono, Maine, primarily serving the University of Maine campus. U.S. Route 2, Route 6 and Route 9 are often used by truckers and other motorists of the Maritime Provinces en route to other destinations in the United States or as a short cut to Central Canada. The Downeaster passenger train, operated by Amtrak, provides passenger service between Portland and Boston's North Station, with stops in Old Orchard Beach, Saco, and Wells. 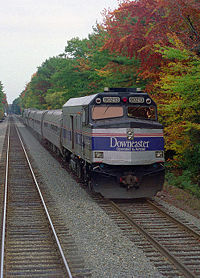 The Downeaster makes five southbound trips and five northbound trips every day. Freight service throughout the state is provided by a handful of regional and shortline carriers: Pan Am Railways (formerly known as Guilford Rail System), which operates the former Boston & Maine and Maine Central railroads; St. Lawrence and Atlantic Railroad; Maine Eastern Railroad; Montreal, Maine and Atlantic Railway; and New Brunswick Southern Railway. Maine's constitution required the establishment of public schools, supported by local towns. In the first session of the Maine Legislature in 1820, appropriations were made for Bowdoin College and the Maine Institute for Literature and Theology. In the second session of the Legislature, a law was passed requiring towns to raise money to support schools; by 1828, the state was contributing to the financial support of public education. Currently, the state supplies one-third of the funding for the public schools. A state Department of Education was created in 1854. A State Board of Education was established in 1949. The University of Maine System and the Maine Community College System are independent bodies, governed by boards of trustees, even though the state Department of Education retains limited oversight. Among Maine's public and private institutions are, in addition to the University of Maine system, Bowdoin College, Colby College, and the University of Southern Maine. As of 2005, Maine had an estimated population of 1,321,505, an increase of 6,520, or 0.5 percent, from the prior year and an increase of 46,582, or 3.7 percent, since the year 2000. This includes a natural increase since the last census of 6,413 people (that is 71,276 births minus 64,863 deaths) and an increase due to net migration of 41,808 people into the state. Immigration from outside the United States resulted in a net increase of 5,004 people, and migration within the country produced a net increase of 36,804 people. Maine is a popular tourist destination in the summer months. Many summer visitors establish an alternate secondary residence in Maine and then depart for their primary residence in the off-season. These are the summer people of Maine lore, often referred to, along with all other out-of-staters, as "flatlanders." Official census figures normally count a person as a resident only once, at the place of the primary home. Therefore, there are some situations in which official census figures could be misleading for Maine. For example, some communities may have a much larger seasonal retail sector than their official, small population figure would imply. 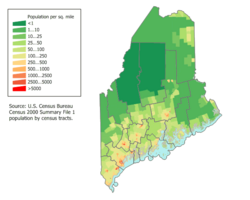 The mean population center of Maine is in Kennebec County, in or near the town of Mount Vernon. The Greater Portland metropolitan area is the most densely populated with nearly 20 percent of Maine's population. . The widest reported ancestries in the state are: English, Scottish, and other British (30.8 percent), French or French Canadian (22.8 percent), Irish (15.1 percent), American (9.4 percent), and German (6.7 percent). Maine is second only to New Hampshire in the percentage of French Americans among United States. It also has the largest percentage of non-Hispanic whites of any state and the highest percentage of current French-speakers. Franco-Mainers tended to settle in rural northern Maine (particularly Aroostook County) and the industrial cities of inland Maine (especially Lewiston) whereas much of the midcoast and downeast sections remain strongly Anglo. The noted American ecologist Rachel Carson did much of her research at one of the Maine seacoast's most characteristic features, a tide pool for her classic "The Edge of the Sea." The spot where she conducted observations is now preserved as the Rachel Carson Salt Pond Reserve at Pemaquid Point. 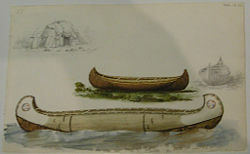 George Lorenzo Noyes, known as the Thoreauvian of Maine is a noted state naturalist, mineralogist, development critic, writer and landscape artist. He lived a devout wilderness lifestyle in the mountains of Norway, Maine, expressing in his paintings his spiritual reverence for nature and writing of the values of a simple life of sustainable living. Maine is the only U.S. state to only be bordered by one state (New Hampshire); all other 49 states have multiple or zero bordering states. The town of Lubec, Maine is the eastern-most point within the contiguous United States - for more information see extreme points of the United States. 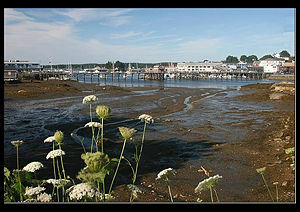 Eastport, Maine is the eastern-most city in the United States. Estcourt Station is Maine's northernmost point and also the northernmost point in the New England region of the United States. Maine is the number one exporter of blueberries and toothpicks. The largest toothpick manufacturing plant in the United States is located in Strong, Maine. The Strong Wood Products Incorporated plant produces twenty million toothpicks a day. Cadillac Mountain in Bar Harbor, Mt. Katahdin in Baxter State Park, and Mars Hill Mountain in the town of Mars Hill each battle to be the first site in the contiguous United States to see the morning's sunlight. Maine's first light depends on the time of year, as the sunrise moves from South to North. From October 7 to March 6, Cadillac Mountain is first. From March 7 to March 24, West Quoddy Head is first in the country. Warmer months, March 25 to September 18, Mars Hill sees first light. Then, when the sun starts getting lower in the sky, The country's day begins between September 19 to October 6 back at West Quoddy Head. Noyes Mountain in Greenwood, Maine, and the Harvard Quarry at its summit. Excellent panoramic views and popular destination for rock and mineral collectors. Samantha Smith, "America's Youngest Ambassador"
↑ Maine: Population estimates. U.S. Census Bureau (July 1, 2017). Retrieved May 6, 2017. ↑ Maine Local Government Portal. Maine City and Town Index, Informe. Retrieved December 21, 2007. ↑ Maine Revenue Services. Unorganized Territory, Informe. Retrieved December 21, 2007. ↑ Department of Education, InforME. Retrieved May 6, 2008. ↑ Portland, Maine. City of Portland, City of Portland. Retrieved December 21, 2007. ↑ MLA Language Map Data Center. Most Spoken languages in Maine, Modern Language Association. Retrieved December 21, 2007. ↑ The Center For Land Use Interpretation. Toothpick Capital of the World Retrieved December 21, 2007. Maine – United States Geological Survey. Historic USGS Maps of Maine – UNH Dimond Library.